Originally from the apple orchards of Northern California, Jonah Katz is a versatile physical comedian. 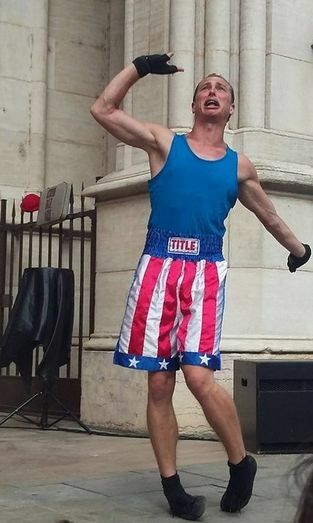 He is a graduate of the Clown Conservatory and the Professional Acrobatic Training Program at the San Francisco Circus Center, received intensive acrobatic training at the Cité du Cirque Marcel Marceau in Le Mans, France, and is a co-founder of Company Cirque en Déroute and Chuck & Charlotte. Jonah has entertained in theaters, clubs, cinemas, and circus tents throughout the globe, as well as on the street in much of Europe, Australia, Northern, and Central America. Jonah completed Cirque Starlight’s 2014 tour, taught clown and tap dance all three years of the Western Clowning Workshop in Nanjing, China, and directed the hit shows Haibao Restaurant and Dream Canteen. Jonah recently received rave reviews for his portrayal of Trinculo in the AASC’s production of The Tempest, and completed and extended run at La Biennale with Cirk biZ’arT.